Developer Easy Software Solutions has brought its popular strategy game, UniWar HD, to BlackBerry 10. The cool thing about this is that UniWar HD is a cross-platform game so BB10 users will be able to play with the numerous Android and iOS players. UniWar HD for BlackBerry will be available for free, even though it's paid on the other platforms. 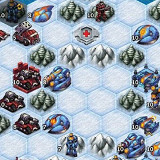 The game shares elements with hit RTS games for the PC like StarCraft, as it features three different factions, each with a number of different unit types. It allows for online play with up to 20 other players at the same time. It's a turn-based strategy, so gamers don't need to be looking at their handsets or have the game open all the time. When an opponent is ready with their turn, the player gets an email notification letting them now that they can now open the game and play their turn. How in the world is this like Starcraft? More like RISK to me. pity WP!!! haha!!! WP is jealous right now!! this game is not available on the platform!! !